Gain more horsepower and torque with CorkSport's 2014+ Mazda 3 cat back exhaust system for Sedans and Hatchbacks. Create a free-flowing system without restrictions. Our optional polyurethane exhaust hangers give your ride that extra level of detail you're seeking, while better controlling the exhaust movement as you tear up a country road. Write a review to share your feedback on the enhanced sound of your 2014 Mazda 3 exhaust. 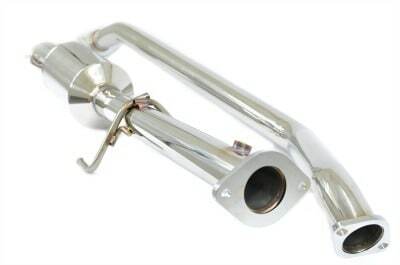 Material: T304 stainless steel is used for all the exhaust components for a long-lasting look and corrosion resistance. 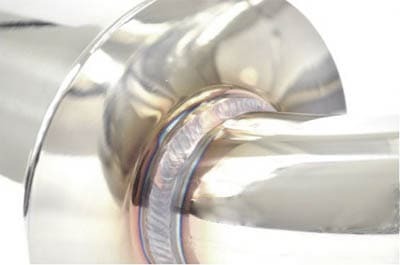 Pipe: Polished true 60.5mm, CNC mandrel bent pipe for the best performance and an exact fit. TIG welded: Precision TIG welding offers long-lasting durability and a lighter weight for the Mazda3 cat-back exhaust. 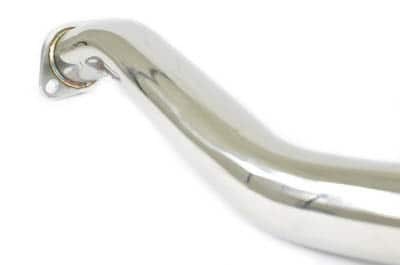 Pipe: Polished true 65mm, CNC mandrel bent pipe for the best performance and a perfect fit. Flanges: 7/16-inch thick CNC, laser cut flanges designed and engineered for durability and warping resistance. Tips: Polished 90mm, dual-wall constructed tip that looks strong and professional with TIG welded badge. High-flow performance resonator: The straight-through design of the resonator reduces in-cab drone without sacrificing performance. It sounds aggressive, but not obnoxious like other aftermarket exhaust systems. Performance and Style: Gain around 5 hp for the 2.0L and 10 hp for the 2.5L models while also having a great looking exhaust! Fits all models: Works will both manual and automatic transmission gas powered Mazda 3s. CorkSport service and support: Includes a 2-year limited warranty, full-color installation instructions, and all necessary gaskets and hardware. We provide knowledgeable telephone support at 360-260-2675. WARNING: The use of the Mazda 3 Cat-Back exhaust will replace your factory secondary catalytic converter. No Check Engine Lights (CEL) will be thrown, but removing the catalytic converter can be illegal, check with your local emissions authorities." It will take you two hours to install the CorkSport Mazda3 Exhaust with our easy-to-use instructions. Would give 6* if I could, I purchased this exhaust system through Australia's only corksport distributor (wolf racing products in Sydney) I installed it yesterday on my 2015 Mazda 3 SP25 with no problems at all and I have to say it exceeds all the expectations I had for it. The sound is amazing when giving it the boot and she has a beautiful purr when cruising, it looks stunning in the polished stainless steel finish and the performance increase is definitely noticeable especially paired with the corksport SRI \ cold air box combination which I had installed a month earlier. I can't praise these products highly enough, anyone with a 2014+ Mazda 3 should have this system installed you won't be disappointed. I am now even more in love with my maz than ever before. Thanks to all the R&D guys @ corksport for making Mazda's kick arse again. I installed my Corksport cat back yesterday on my 2018 Mazda 3 GT Sedan and I am beyond happy with it. The welds are superb, install was simple (kudos on the full color instructions), and the sound is exactly what I wanted. I installed it at the dealership that I work at and everyone I work with was very impressed by how it sounded and looked. It continues to turn heads! Thank you, Corksport, for making a wonderful product and helping get it to me quickly, as well. Easy to install. Sounds amazing! I definitely notice the increase in power with the combination of the air intake to now the performance exhaust. Good customer service. I will definitely be a return customer. Just installed this over the weekend, and it is such a wonderful sound. The startup is a little on the loud side, but it sounds deep and powerful for a 2.0L. 1000-1800 rpm is a very deep note. While 2000-3500 is a bit of a dead zone, it is convenient for cruising (very little droning). The sound picks back up in the higher range, but the cabin blocks alot of it. bought on black friday. got it yesterday, installed today. took about 1h45m to finish. sounds awesome!!! Fitted my Corksport cat back system yesterday and am very happy with it. It has a really deep bass note and was easy to fit. The build quality of this exhaust is amazing! Its a shame it is under the car where you dont see it easily. I highly recommend this exhaust and was very impressed with how my purchase was packaged and shipped. Great service Corksport, thank you. will this fit the 2018 mazda 3 sp25 sedan? I just bought my first mazda, 2017 Touring, manual trans sedan. My rear bumper does not look like that will it still fit? Where did you get a bumper that has cutout areas for the exhaust tips? Thank you! My brother just got this installed on the exact same car as yours. Just make sure to select sedan not hatchback. The sedan exhaust will have the tips angled slightly downwards. You won't have any problems with the fit. Is this legal in Illinois? Also, do you offer any incentives for purchasing multiple items like exhaust, intake, etc.? Check with your local emissions laws. For Illinois it is https://www.dmv.org/il-illinois/smog-check.php The exhaust system does not trigger a check engine light. 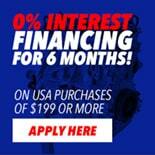 Check with our sales team Sales@corksport.com to see if there are any special running. This is everything after the stock exhaust manifold. Will it fit a Mazda 3 Sport GT 2.5 2018 ? I was wondering if the cat-back system would fit with the aero kit. I was told that the axle back doesn't fit, is there any difference? I looked around but didn't find an exact answer. But will this fit a 2016 Mazda3 i Sport model? It fits 2014-2018 models with the 2.0 or 2.5 engine, both manual and automatic gearboxes. Do you have a racepipe that can be used with this system? Our catback version includes the racepipe. Estoy en Lima-Peru, puedo comprarlo? Cual seria el precio? Send us an Email to Sales@CorkSport.com and we can work on setting up an order! Is the mid pipe available for sale separately? Yes, it is, But you need to call in to order them. Thanks! Is the catalytic converter left intact? I believe this is required to pass emissions in Missouri ...? Being a Cat Back, yes it does. It bolts on behind the Cat. Will you be producing a cat back for a 2.5L GT Sedan? Will I need a tune to see the hp gains? To truly use its potential a tune would be required. However, you will see some gains from getting the exhaust on and removing those restrictions. I have a 2015 Mazda 3 Sport with a 2.5 motor and the vehicle as the factory Aero-Kit with rear diffuser (PN: QBMA-50-360 -PZ). Will I have any issues with the exhaust tips hitting the rear body panel? Same question if I lower the car using the Corksport lowering kit? What its the total shiping weight for the hatchback model? Thanks. Give us call at 360-260-2675 so we can give you proper dimensions. Would it be possible to special order this with larger tips to better fill out the space in the bumper? Will this fit a 2016 Mazda3 S Grand Touring Sedan 2.5 auto. I'm from Toronto, Ontario. Is there any local retailers for Corksport products so i don't have to pay the expensive shipping rate?? what's the ID of this system and what's the OEM/stock ID? Will all the original undercarriage panels fit back on after the install (5 door hatch)? Yes it will. It should be direct fitment. Just to be clear...the cat-back midpipe replaces the stock resonator and catalytic converter with just a resonator? That is, you lose a catalytic converter by installing the cat-back? Yes, but the secondary catalyst you are deleting is not monitored so it will work perfectly. Will this be legal in NJ? and if so will it pass any test to prove it is legal? This depends on how strict the emissions laws are where you are. Normally an exhaust will not make you fail emissions if you have a catalyst to monitor things. Will this fit a 2016 Mazda3 2.0L sedan? i believe my 1.6 hatchback has only one sided exhaust does this gonna fit ?! and in the bumber ?! We do not have an intake to sell you for your specific vehicle yet. So this will definitely fit a 2014 2.5L Hatch? the catback fit on 2.5 man ? Will this fit on a 2.0 Hatchback AT transmission? Yes it will, just make sure you choose the correct options when making the purchase. What HP and TQ gains will I see to the wheels with the cat-back on the 2.0? Also, will this require a tune? All versions are in stock. For the 13 or so states that have adopted clean air laws similar to California's (such as Maryland), would a cat-back be legal in those states, or is replacing the secondary cat converter down there illegal? Check with your local emissions laws to see what is ok.
Would the Corksport midpipe designed for the hatchback fit on a sedan? For example, does the hatchback have a difference length midpipe than the sedan. Or is the only difference between the hatchback and sedan version is how the exhaust tips are angled? If i buy the cat-back, can i just install the axle back part first since i still have warranty in my car or should i just buy the axle back and order the rest of the middle pipe later? I would buy it all at once, it is cheaper. You can install the mid pipe as you want from there. Will this pass an OBDII check in Texas? It will pass an OBDII test. is this available right now? It is out of stock until June 29th 2015. Can I attach the muffler for the sedan cat back exhaust directly to the OEM mid pipe like an axle back install? I'd like the option to not have to run the CS mid pipe assembly if I purchase the cat back system. what is the dB reading between stock and corksports exhaust? at idle and max dB reading. Any idea if this is legal in Pennsylvania and will pass inspections? We recommend checking with your local emissions laws to see if the exhaust will be ok. If in doubt call and ask them. Will this fit a 2015 sedan 6 speed manual transmission? is the bolt flange angled downward and are the bolt holes even or offset? The flanges are angled to line up and fit perfectly with the stock exhaust. Is this catback exhaust could fit on 2014 mazda3 2.0 sedan? if it's not, which catback system could fit on? It would fit a 2014 sedan. What is the HP difference and the sound difference between the axle back and cat back for the 2.0 sedan? The Catback probably adds about 10% in volume and about 2-3 more horsepower than the axleback. Since the tips are aimed down and never reach the back bumper it should be fine, but we have not tried it with the lip kit. Send us an email at Sales@CorkSport.com we should be able to sell just the midpipe. Thanks corksport for answering all the questions. Final question, do you guys have an estimate # on the ft/lb torque increase this CBE will provide on the 2.5L? Thanks a lot!! Estimated ft/lb is going to be about 3-4 ft/lbs. Regardless of whether this is legal is California, do you know if it will pass smog? It would pass smog in most states, but not in California due to their strict emission standards. If they simply do an OBDII check it will pass, if they do a sniff check it depends on the specifics. If they do a visual inspection to make sure it is OEM, it will fail. This is not approved, or tested, or passed any German certifications. I cant tell if the sedan version is angled downwards? Also, is the video posted for the 2.5L sedan or 2.0L? The tips on the Sedan version are slightly turned down. The video is all from a 2.5L car. Do you have dyno charts with both the axle/cat versions installed on the 2.5 with auto? I would be curious to see stock v.s. both intake and exhaust installed! Thanks! We do not have dyno of the axle vs cat auto. The cat-back should give about 4-6hp, the intake should also give about 4-6 hp. Will this exhaust fit if you have an automatic transmission model? The exhaust works with manual and automatic transmissions.